It has been almost seven years since Congress introduced inter partes review (IPR) and other postgrant proceedings to challenge issued claims at the Patent Office’s Patent Trial and Appeal Board (PTAB or Board). These proceedings were introduced to provide a mechanism to expeditiously resolve issues of patent validity in response to the perception that validity challenges in the federal courts were too difficult, costly, and time-consuming. Since that time, the utilization of these procedures has exceeded expectations. For biopharma patents, the use of these postgrant proceedings was initially slow, but the number of filed petitions has gradually increased as generic and biosimilar manufacturers have discovered their usefulness. In particular, IPR filings in the biopharma space have been used strategically to help eliminate blocking patents before an abbreviated new drug application (ANDA) or abbreviated biologics license application (aBLA) is even submitted to the FDA. Correspondingly, for fiscal year 2018, biopharma patents accounted for 11 percent of all petitions filed, which is up considerably from 6 percent for fiscal year 2014. In 1984, Congress enacted the Hatch-Waxman statute to create an abbreviated approval pathway for generic small molecule drugs. In doing so, it crafted a fine balance between the interests of branded pharmaceutical NDA holders and generic drug product manufacturers. As part of this balance, ANDA filers were allowed to challenge the validity of patents covering the drug product and methods of its use without needing to launch at risk. The statute also provided for the creation of the Orange Book, which lists all such patents. The introduction of IPRs, however, threatens this carefully balanced patent-resolution scheme, potentially shifting any advantage away from patent and NDA holders and toward generic drug manufacturers. Correspondingly, pharmaceutical patent owners have been outspoken about the creation and existence of IPRs. Likely in response to these concerns, the Patent Office conducted a study of IPRs involving Orange Book-listed patents. The study assessed the total number of biopharma IPRs and found that about half of them are listed in the Orange Book. More recently, however, there has been a shift toward nonlisted patents, likely due to the rise of IPRs in the Biologics Price Competition and Innovation Act (BPCIA) context for biosimilars. The study also noted that the institution rate for Orange Book-listed patents was comparable to the cumulative overall rate (66 percent versus 68 percent). (At an early stage in the proceeding, the PTAB determines whether to institute trial for each petition. The institution rate, therefore, is the percentage of petitions that the PTAB determines at this stage will have a reasonable likelihood of success.) When compared to all other biopharma IPRs, however, the institution rate for Orange Book-listed patents was higher (66 percent versus 60 percent). On the other hand, the study found that for instituted petitions that proceeded to conclusion, all challenged claims were found to be patentable in 51 percent of such cases (compared to 17 percent for all other technologies). The Patent Office concluded that Orange Book-listed patent holders fare better than all other technologies combined at the final written-decision stage. This study by the Patent Office should have allayed some of the fears of NDA holders. Nevertheless, anything that disrupts the Hatch-Waxman balance is still going to be viewed with skepticism. As a potential response, in February 2019, the Hatch-Waxman Integrity Act of 2019 was reintroduced in Congress with the goal of removing IPRs as an option for both ANDA and BPCIA litigations. This new legislation would require generic or biosimilar applicants to certify that they did not file any relevant IPRs and that they are not relying on a relevant PTAB decision. If the applicant cannot make that certification, it will not be able to take advantage of the abbreviated pathway. It is unclear whether this measure has sufficient support, but if enacted it would cause a significant shift for patent invalidity challenge strategy in the biopharma space. For the time being, IPRs remain a viable option for anyone seeking to challenge a biopharma patent. There are many advantages to using this procedure over litigation. For example, petitioners benefit from a lower standard of proof (preponderance of the evidence instead of clear and convincing evidence). However, IPR petitioners no longer benefit from broader claim construction because the board has now adopted the district court standard. Moreover, the proceedings are decided by a panel of administrative patent judges who are highly technically trained. This can be especially relevant in highly technical areas, such as biopharma, where district court judges and juries might struggle with the complex issues raised. In addition, IPRs do not have the same standing requirements as district courts, where parties must have an actual case or controversy to proceed. As such, because the courts have determined that standing does not exist for them to entertain challenges to a patent before an ANDA or aBLA is filed, IPRs have become a viable option to clear the patent space prior to an FDA review. Nevertheless, there are some significant disadvantages to using IPRs. Unlike in district court, an IPR petitioner must present its entire case with the first filing. This can be challenging, especially because it is difficult to anticipate the patent owner’s response. Also, many of the documents required to establish certain issues, such as secondary considerations of nonobviousness, may be in the sole possession of the patent owner. Obtaining these documents through discovery is exceedingly difficult in the PTAB setting. Finally, even though there is no standing requirement to file an IPR petition, standing must exist for any party wanting to appeal an adverse decision to the Federal Circuit. This is problematic because any adverse decision could prevent the petitioner from ever being able to later bring the same or related challenges in district court. The U.S. Court of Appeals for the Federal Circuit has recently determined that the existence of an Orange Book-listed patent confers standing to appeal in the case of an applicant that has already submitted its ANDA. However, in a case that addressed whether a biosimilar manufacturer could have standing before its aBLA was filed, the Federal Circuit ultimately dismissed the appeal as moot because the biosimilar development was dropped before the appeal was completed. Therefore, the question remains whether a biosimilar developer that has undertaken significant investment could have standing to appeal an adverse IPR decision prior to its filing an application with the FDA. In the past two years, there have been over 100 final written decisions for biopharma patents. Many of these petitions were filed in advance of, or in conjunction with, a biosimilar application filing. While each case is fact-specific, some trends have begun to emerge. WHAT CONSTITUTES A PRINTED PUBLICATION? The statutory provision for IPRs provides that the only permissible challenges are lack of novelty and obviousness, and that these challenges can be based on only prior art consisting of patents and printed publications. The issue of whether a document constitutes a printed publication has been previously addressed in district courts, but patent owners are regularly challenging the public accessibility of these references at the PTAB. And for good reason — a challenger is required to submit all evidence with the initially filed petition. If the patent owner can cast doubt on whether a reference was publicly accessible, it can succeed in killing the petition prior to institution. For example, in petition IPR2017-01166 (Pfizer v. Biogen), the Board did not institute trial because the petitioner had failed to establish that a copy of the Rituxan label was publicly accessible before Aug. 11, 1998, even though the label itself reported to be available from the FDA’s website as of Nov. 26, 1997. In such cases, the board has been unwilling to fill the perceived gaps in the evidentiary record. ARE SECONDARY CONSIDERATIONS HELPING TO ESTABLISH NONOBVIOUSNESS? There are four factual inquiries to help determine whether an invention is obvious. A prima facie case requires consideration of the scope and content of the prior art, the differences between the claimed invention and the prior art, and the level of skill in the art. These are balanced against secondary considerations or objective indicia. For example, if a product is commercially successful, it might suggest that a skilled artisan would have been motivated to make it previously if it were indeed obvious. The PTAB, however, has been reticent to give secondary considerations much weight in biosimilar IPRs. When asked to do so, the board often finds that a nexus is lacking between the consideration and the claimed invention. This is especially true when there is a blocking patent that would prevent the practice of the claims. For example, in IPR2016- 00172 (Coherus v. AbbVie) involving a Humira dosing patent, the petitioner asserted that adalimumab was known and patented at the time. The Board found that the presumption of nexus was rebutted. IPRs remain a viable option for challenging biopharma patents, especially before any FDA filing. However, IPRs might not be the expected panacea in all cases. Petitioners should monitor trends at the PTAB in order to afford themselves the greatest chance of success. 83% of all petitions challenging Orange Book-listed patents result in the patent being unchanged by PTAB. The cumulative institution rate for Orange Book petitions (66%) is essentially the same as the cumulative overall institution rate (68%). Just over half of all final written decisions for petitions challenging Orange Book-listed patents find all claims patentable. 80% of all challenged Orange Book-listed patents have one or two petitions, compared to 87% of all challenged patents. 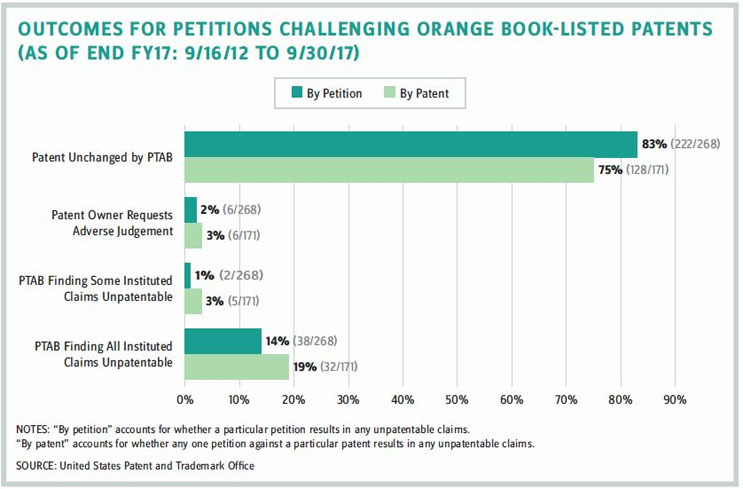 85% of all challenged Orange Book-listed patents have one or two petitioners, compared to 94% of all challenged patents. 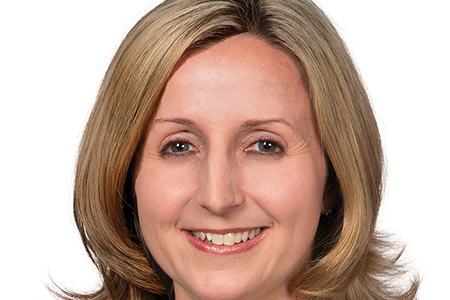 OONA JOHNSTONE, PH.D., is shareholder, biotechnology at intellectual property law firm Wolf Greenfield in Boston. She focuses her practice on U.S. and foreign patent prosecution, IP due diligence, client counseling, and postgrant proceedings, including IPR. 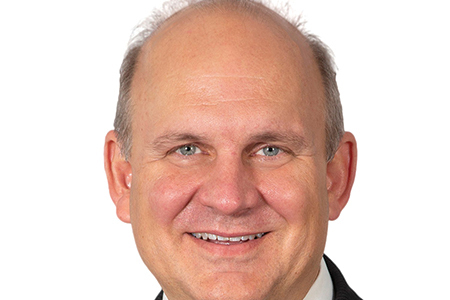 ANDREW WILLIAMS, PH.D., is counsel, biotechnology at Wolf Greenfield. He counsels clients in patent prosecution and patent litigation with a focus in the areas of biotechnology, pharmaceuticals, and molecular diagnostics.